Publicat pe 12 februarie 2014	de Cristi M.
A-ha made a return appearance at the Nobel Peace Prize Concert in 2001. The subsequent album, Lifelines, was released in 2002, going platinum in Norway and producing two Top 5 hits, „Forever Not Yours” and „Lifelines”. Jesper Hiro directed the video for „Lifelines”, based on the short film A Year Along the Abandoned Road, which was directed by Morten Skallerud in 1991. The original short film was 12 minutes long; it shows a whole year passing by in one shot at 50,000 times the normal speed. A live album from their 2002 tour, titled How Can I Sleep with Your Voice in My Head, was released in March 2003, preceded by a live single of the 1986 hit „The Sun Always Shines on TV.” In 2004, a book entitled „The Swing of Things” was published, which also featured a CD of early demo material. That year A-ha celebrated their twentieth anniversary with the release of a new singles collection, The Definitive Singles Collection 1984–2004. This compilation brought them back into the UK Top 20 Album Charts, where they reached number thirteen and earned a Gold album. Acest articol a fost publicat în Video și etichetat a-ha, a-ha biography, a-ha discography, a-ha fan, a-ha history, a-ha songs. Pune un semn de carte cu legătura permanentă. 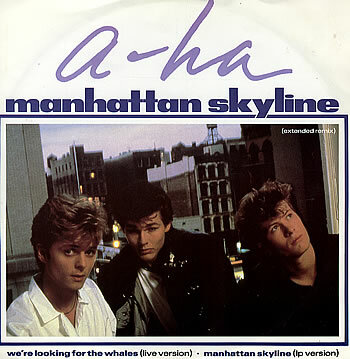 2 răspunsuri la A-HA – Manhattan Skyline.